Maguroya Kurogin Honten opens in the Kuromon Market (located in Osaka's Nipponbashi area), mainly serving bluefin tuna for sushi take out, while also specializing in tuna retail sales. Oma tuna supplied (180 kg) at the Kuromon Market year-end selling spree. All stock sold out. Featured on Osaka's Mainichi Broadcasting System's Maho-no Restaurant "Department Store Food Floors vs. Kuromon Market" program, serving bluefin tuna katsu-sandwiches. Evening izakaya (pub) business commences at Maguroya Kurogin Honten. 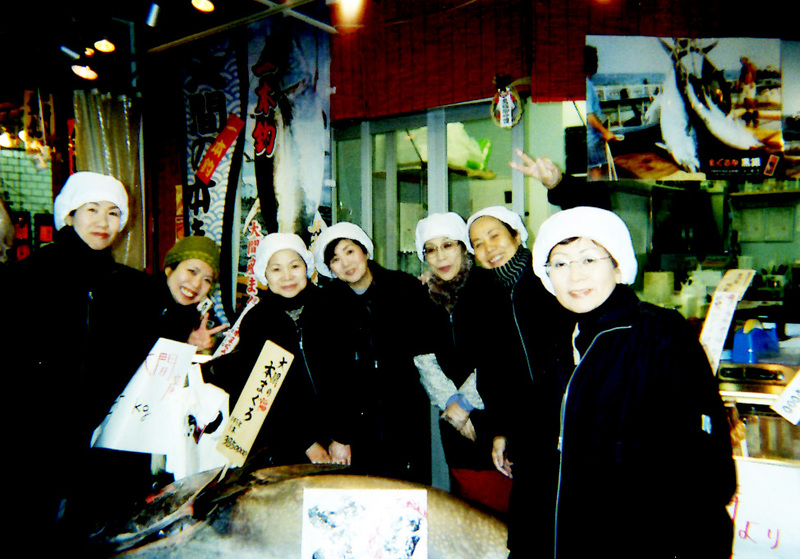 Featured on Osaka's Mainichi Broadcasting System's Maho-no Restaurant program, serving bluefin tuna shabu shabu. For the second year in a row, our booth is part of the Kuromon Market promotion at Hanshin Department Store (Umeda Flagship Branch). Our booth is part of a special event at Sogo Shinsaibashi (Flagship Branch), serving take out and dine-in tuna sushi. Featured on Osaka's Mainichi Broadcasting System's Seyanen! program, serving Oma bluefin tuna tekka bowls and tuna curry. Our booth is part of the winter hot pot special event at Hanshin Department Store (Umeda Flagship Branch), serving tuna shabu shabu and single-serving negima hot pot. Sister shop Maguroya Kurogin Tenmabashi opens. Featured on Osaka's Mainichi Broadcasting System's Maho-no Restaurant program, serving hamburger steak and bluefin tuna tekka bowls. For the second year in row, our booth is part of a special event at Sogo Shinsaibashi (Flagship Branch), serving take out and dine-in tuna sushi. Our booth is part of Seibu Department Store Tokorozawa's "Spring Season Best Flavors of Japan" event. Our booth is part of a special event at Odakyu Department Store (Shinjuku Branch, Tokyo), serving take out and dine-in bluefin tuna sushi. In a collaborative effort, boxed meal sets of mizunasu eggplant from Kuromon Market's Iseya Shoten, charcoal grilled unagi (eel) from Shinuoei, and bluefin tuna from Kurogin were offered for the first time. For the second year in a row, our booth is part of the "Naniwa Umaimon Market" promotion at Tokyu Department Store. Maguroya Kurogin opens on the food floor of Shinsaibashi Daimaru Flagship Store. Maguroya Kurogin opens on the food floor of Shinsaibashi Sogo. Our booth is part of the nationwide premium sushi competition at Keio Department Store (Shinjuku Branch, Tokyo). Maguroya Kurogin on the food floor of Shinsaibashi Sogo closes. Maguroya Kurogin on the food floor of Shinsaibashi Daimaru Flagship Store closes. Our tuna ramen is featured on the 400th special anniversary episode of Maho-no Restaurant. Sales of "negitoro ehomaki" commence on the food floor of Shinsaibashi Daimaru Flagship Store. Sister shop Maguroya Kurogin Tenmabashi closes. We purchase our five-story headquarters building (Nipponbashi 2-chome, Chuo-ku, Osaka). Our booth is part of "Manpaku In Banpaku" (Japan's largest food festival). We take 2nd place in the "gourmet" rankings. Maguroya Kurogin Tsukiji Jogai Ichiba Honten opens. Specialized tuna wholesale trading company Kaiko established through joint investment by Japan Silver Seas and Nagase Suisan. Our booth is part of "Manpaku in Tachikawa". Our booth is part of "Rock In Japan Festival". Our booth is part of "Manpaku in Banpaku". Our booth is part of "Yamanashi Food Festival". Free-of-charge rest area opens on the 2nd floor of Kuromon Honten. Copyright (c) Maguroya Kurogin. All Rights Reserved.